Thursday’s by-elections in Clacton and Heywood & Middleton, plus the forthcoming as-yet-unscheduled contest in Rochester & Strood, will bring the total number of by-elections in this parliament to 21. 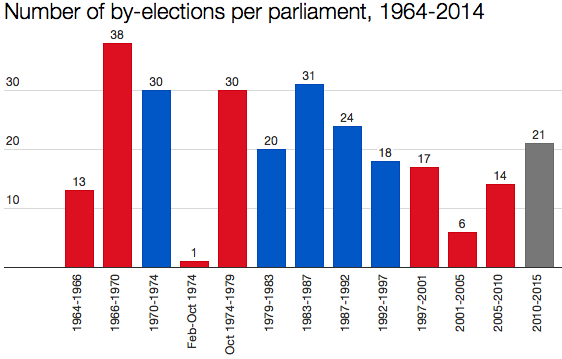 It’s more than any parliament since 1987-92, but some way behind the bumper totals of the 1960s and 70s. 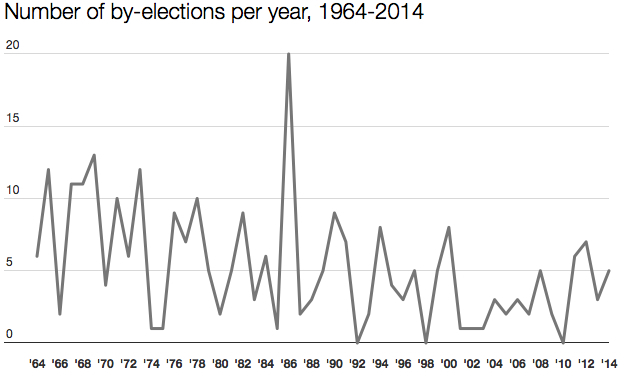 The varying lengths of the parliaments of the past half-century make it hard to discern any sort of pattern in the number of by-elections, though it’s clear the overall volume has declined. Consider the four-year Labour government of 1966-70, when 38 by-elections took place: that’s over six times the number that took place in the four-year Labour government of 2001-05. Fans of by-elections have certainly endured some barren periods of late. Making do with just one contest per year in 2001, 02 and 03 was particularly trying. Thankfully things have picked up recently. And with six months of this parliament still remaining, there’s every chance the 2010-15 total of 21 could creep still higher.